NATO countries shown in blue. 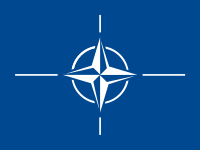 ↑ "The official Emblem of NATO". NATO. Archived from the original on 2012-05-27. Retrieved 2008-02-20. Àtunṣe ojúewé yi gbẹ̀yìn wáyé ni ọjọ́ 8 Oṣù Kejìlá 2016, ni ago 21:23.